Your gift plays a significant role in the future of Youth Challenge. Youth Challenge provides free transportation and programs, so we rely on the generosity of individuals, businesses, community organizations, and foundations to fund our services. 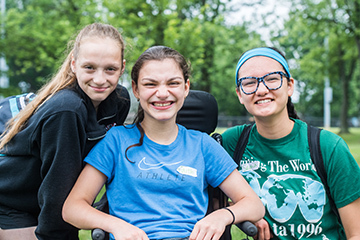 With your support, Youth Challenge can continue to bring together young people with physical disabilities and teen volunteers to experience unique opportunities through adapted sports and recreation activities. There are many ways to support YC, whether it is sponsoring a child, attending or sponsoring a special event, a cash gift, and a matching gift, through planned giving and our endowment fund, and others. The Annual Fund is YC's largest fundraiser and supports general operations at Youth Challenge. In 2009 Youth Challenge lifted program fees for all participants. Youth Challenge secures funds from individuals, businesses and organizations to support participants, volunteers and programs. Sponsorships are used for the participants' program costs and directly impact their lives and their families. The standard cost to sponsor a participant for one year is $1,500. Donations of smaller or larger sizes are also appreciated. Donations are welcome in the memory of family or friends or to celebrate an anniversary, wedding, birth, holiday, etc. Please indicate the individual's name in the comments section of the check-out form. Youth Challenge will not sell or trade any donor’s personal or contact information with any individual or organization. Please contact Mary Sue Tanis, Founder & Executive Director, if you have questions or concerns. Thank you for helping us to provide kids of all abilities opportunities they would never otherwise have without Youth Challenge. Youth Challenge is a private non-profit agency with IRS 501(c)(3) tax-exemption status. If you have any questions on making a donation, please contact Youth Challenge at (440) 892-1001. Copies of YC’s financial statement and IRS 501(c)(3) letter are available upon request.